Bedder - short for 'bedmaker', a housekeeper in a college at the University of Cambridge. Jane – The endlessly entertaining bedder (cleaner) at Romsey Terrace. Bedders at Robinson College fell into three divisions: the kindly old bedders such as Lorraine (first division); the Generic Poles (second division); and Jane (third division). Jane's presence in the third division is due solely to the fact that she didn't actually clean, but rather sat on her arse all day in 35 Romsey reading the paper. It was always our house she chose, for some reason. Perhaps she liked us. Anyway, there were so many facets to Jane's (completely unintentional) humour that we always forgave her utter lack of motivation to actually do her job. She collected any change we left in our rooms and put it in a charity jar (without our consent), we're pretty sure she drank some of Stew's vodka (and refilled the bottle with water) and she never shut up about her bloody dog. Oh god, the dog. It sounded like the worst dog imaginable. Perpetually on death's door, requiring an expensive cocktail of medication just to keep it alive day from day, Jane would tell us how it would constantly try to bite her hand when feeding it. Every morning, as we were rushing to leave the house to get to lectures, she would tell us at great length about the latest near death experience or frenzied attack. Our kitchen after Jane had 'cleaned'. Another popular topic of conversation was her new car, which was actually pretty nice; a black sporty number, we could never work out how she afforded it, but found it hilarious when she told us that the seller recommended she should only fill it with Super V unleaded (or something similarly expensive), which meant she drove miles out of her way every time she needed to refuel to find the only garage in a 50-mile radius that stocked it. Jane had many other idiosyncracies. Her tea drinking habits, for example, were legendary. We offered her milk, we offered her a mug, we offered her a fridge, but no; Jane liked to keep her own supply of milk in a locked cupboard under the stairs (where it tended to curdle) and drank her tea from crappy little plastic cups, which would often warp–and probably degrade, releasing a whole host of toxins–when filled with boiling water. On top of this, Jane put the milk in the cup first, then put the teabag in the milk, and then added the water. This is what greeted us when we came down to breakfast every morning: our resident skanky friend, replete with greasy ringlets, sat in our kitchen, reading our paper, nursing a cup that was melting as she drank from it, filled with hot water added to a cold, wet, teabag, in milk that was probably sour, while telling us about her frenzied dying dog. Rob went right off his breakfast on 25th April 2008, when Jane bent over and he got an eyeful of her grop (the dead, fleshy, fatty area round the sides of a waist). He sent a ZDIS reporting this incident and then went to lie down in a dark room for a while. Jane also had a very individual approach to the English language. She liked to pronounce 'bluetooth' as “blue tuff”, and spoke in a strange Norfolk farmer dialect of her very own, in which everything ended with “didn't they?”, “aren't we?”, “in't it?” or something equally incomprehensible: “bloomin' David's still asleep! Nobody's not awake yet, aren't they?” Ah yes, David. Jane thought Dingly was called David (as does Stew's friend, Nikul). This was partly our doing: we told her in the first week that he was called David and that 'Tom' was just his nickname. 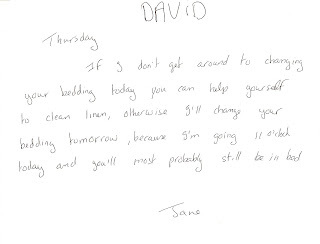 This is an actual note (pictured) that Jane left for Dingly one morning. She also tended to refer to him as a “proper grumpy guts” when he shuffled downstairs bleary eyed and half-dressed in the morning. Finally, Jane wasn't a big fan of the Lads; when we raided the Legacy after exams and stole everything out of their kitchen, she told us to give them their pineapple back but said “we'll keep their clock here, eh, shouldn't we?”. Jane, you will be missed.